Phytoceramides by Potent Organics rejuvenates skin and leaves it smooth to the touch. It reduces wrinkles in problem areas like around the eyes and mouth, and tightens and firms skin on cheeks, chin, and neck. It is also gluten free and contains all natural ingredients. 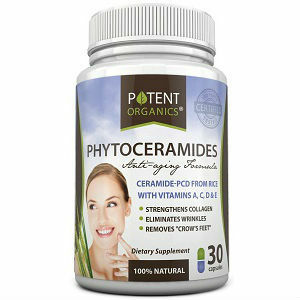 Phytoceramides use the fastest-acting, most effective formula on Amazon. 50mg of rice-based Phytoceramides are more effective than 350mg of other types of similar skin products. It works from the inside out to promote collagen production, and replenish essential vitamins & antioxidants. This binds skin cells more tightly together, giving firmer skin, and getting rid of wrinkles. Potent Organics Phytoceramides is manufactured in the United States in an FDA approved facility, under Good Manufacturing Practices (GMP) and at the highest level of quality control. Each batch is 3rd party tested for purity. Other ingredients: Long grain rice flour, vegetable capsule, magnesium stearate (no exact amounts are given for these ingredients). Serving size – 1 capsule. The product source does not specify or recommend the number of servings to be taken daily – 1 or more than 1. $21.87 for a 30 capsule container. The product can be purchased on line. The manufacture offers a 100% money back guarantee but provides a number of key restrictions on refund eligibility. For example, the money back offer expires after 30 days from date of purchase. Returned products to be eligible for a refund must be in their original packaging and unopened otherwise the returned item is not eligible for a refund. The manufacture will exchange products that are defective or damaged on receipt but the damaged or defective item must be mailed back to the manufacturer at the customer’s expense first. The product source provides a mailing address for this purpose. The product source does contain a phone number for the manufacturer and for the manufacturer’s customer service and also contains a number of customer testimonials. Finally, the product source includes a web based tool for sending questions and comments to the manufacturer. Product ingredients are well documented and the testimonials included in the product source are impressive as is the FDA approved manufacturing facility used to make the product. Despite this the product is still expensive if used for an extended period of time (over $260 if used for 12 months) and the product return/refund policy is restrictive.Also the product source does not provide daily product dosage information. For these reasons anyone considering this product may want to have a medical professional review the product and its ingredients prior to purchase. Jack Webster	reviewed Potent Organics	on February 4th	 and gave it a rating of 2.